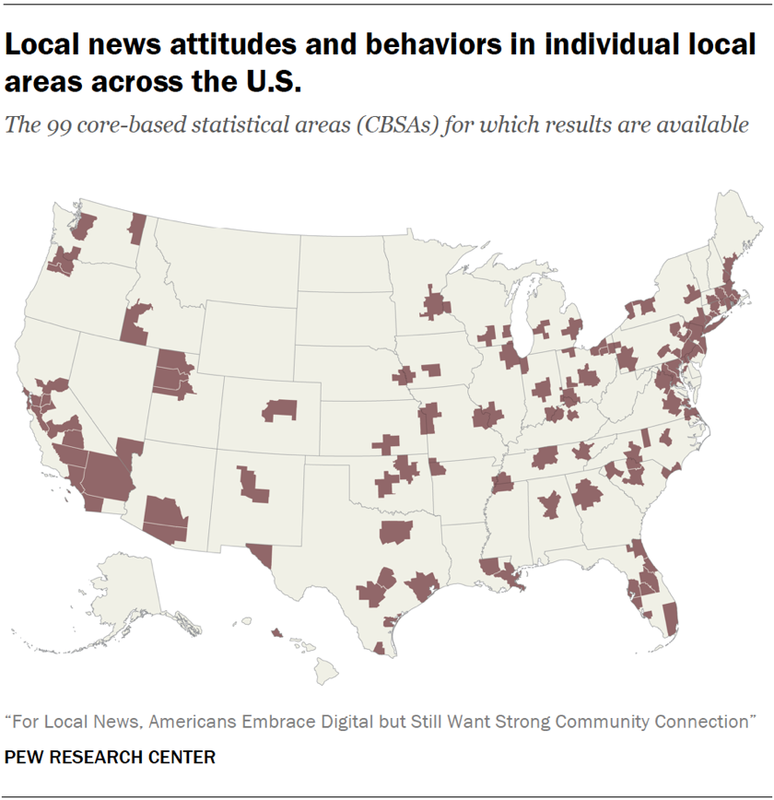 For 31 local areas, the interactive also shows which specific sources each area’s residents named as their main source for local news. These 99 local areas, defined by the U.S. federal government as core-based statistical areas (or CBSAs), can roughly be described as urban centers and their adjacent counties, such as San Antonio-New Braunfels, TX and Minneapolis-St. Paul-Bloomington, MN-WI. If you live in an area with a smaller population, the interactive allows you to search for your own local city and see grouped results about local news habits and attitudes for areas similar to yours based on factors such as income, race and ethnicity, and voter turnout. The estimates for these 99 individual CBSAs were produced using a method known as multilevel regression and poststratification (MRP), a statistical method designed to compute more precise estimates for small subgroups than is possible with conventional survey analysis techniques. For more on how these modeled estimates were calculated, see the methodology that is part of the full report. You can also download a spreadsheet with each area’s results in the interactive.